Jammu, April 7 – The Governor, who is the Chairman of the Shri Amarnathji Shrine Board, stressed the need for putting in place all the Yatra-related facilities, including power, water, medical, essential commodities, accommodation etc, at Baltal and Nunwan Base Camps, various halting points enroute and in the Holy Shrine area, well before the commencement of Shri AmarnathYatra 2011. He emphasized that the Langar service should be ensured for the Yatris at all the identified places till the conclusion of the pilgrimage, to avoid any inconvenience to the pilgrims. 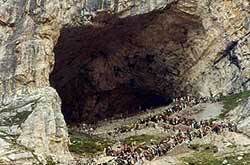 The Shrine Cave of Shri Amarnathji. The Governor asked the Chief Executive Officer of the Shrine Board, Mr. R. K. Goyal to distribute among all the stakeholders a telephone directory containing the details of the Camp Directors, Langar Organisations and each of the other Service Providers to ensure improved coordination at all levels. He also issued instructions for displaying guide maps and Do’s and Don’ts display boards at each Camp indicating, in different colours, the location of tents, ponies, pithus, Langars, STD booths, medicare units etc. He said that the Do’s and Don’ts written on boards should also be displayed at conspicuous places for the guidance of the visiting pilgrims. The Governor said that the repair and maintenance of toilets, baths, paths, drains etc should be taken up at the Base Camps and enroute, on urgent basis, as soon as the snows melt. On this occasion, Mr. Vijay Thakur, President, SABLO presented a cheque for Rs. 2 lakh, as a voluntary contribution to Shri Amarnath Shrine Board, for undertaking sanitation related measures. The Additional Chief Executive Officer of the Board, Mr. Preet Pal Singh also attended the meeting. President of SABLO assured the Chairman of the Shri Amarnathji Shrine Board, that they will fully regard his direction and devote special attention to maintaining cleanliness in the entire Yatra area, particularly in and around the Langar areas, adding that they shall launch a campaign for this purpose. 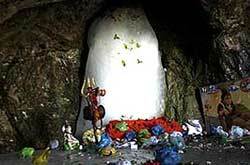 Read more information on Shri Amarnath Yatra 2011. Kheer Bawani is the most revered shrine of Kashmiri Brahmans. The devotees of the Goddess fast and gather here on the eighth day of the full moon i.e. June 9th 2011. Helicopter travel to Shri Mata Vaishno Devi between Katra and Sanjichhat has come down to Rs.699/- per passenger.